It is that time of year again. Spring Break brings locals and visitors back to the beach for fun in the sun. It is important to remind folks that part of having fun is playing it safe. At the beach, this means knowing and following some pretty basic safety guidelines. Not all beaches have lifeguards present, you have to be responsible for your own safety. When visiting the beach, it is important to consider the tide and surf conditions. 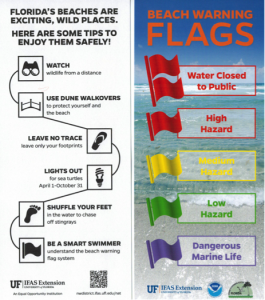 To minimize the risks of drowning or serious injury, a uniform warning flag program was developed for use by Florida’s beachfront communities. 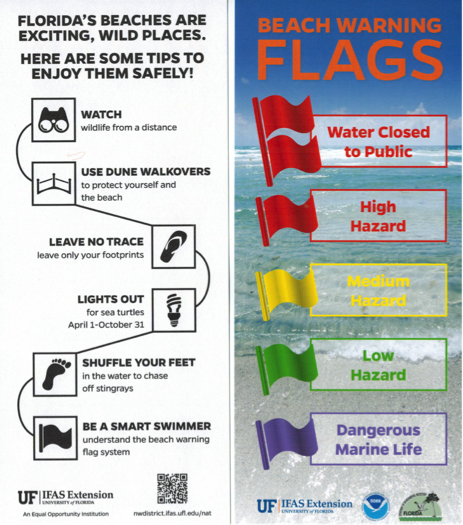 Florida’s beach warning flag program uses flags in four colors accompanied by interpretive signs along the beach to explain the meaning of each color in both English and Spanish. Please follow the guidelines and flags posted. You also need to check for the presence of rip currents. Rip currents are powerful currents of water moving away from the shore. They can pull even a strong swimmer out to sea. It is best to not enter the water where a rip current is present. However, if you find yourself caught in one, try to relax and don’t fight the current, swim out of the current parallel to the shore and swim to shore when you no longer feel the pull of the current. Protect your skin. Just one blistering sunburn in childhood or adolescence more than doubles a person’s chance for developing melanoma later in life. Racking up more than five sunburns at any age also doubles the risk for melanoma. Keep sunburn at bay by properly applying sunscreen of SPF 15 or higher. Try to spend some time in the shade, wear a hat and sunglasses to protect your eyes. Remember to hydrate by drinking plenty of water too. It is good to know a little bit about and appreciate the ocean life you might meet on the beach. Shark attacks aren’t common, especially in shallow shore areas, but always be on the lookout. Shells on mussels, clams and oysters can be very sharp so be careful walking near them. Some species of jellyfish have tentacles that contain venom and can sting you. Avoid them if you can. Learn about the animals you will find at the beach and you will be able to co-exist with little risk. Many ocean creatures need our protection. Sea turtles and many shorebirds are protected and there are things you can do to help them. 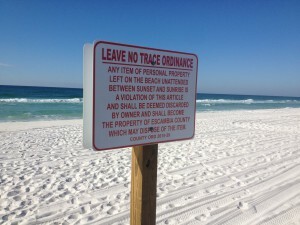 For sea turtles, keep the beach clean (remove all trash and furniture), dark (turn off lights on beach and don’t use flashlights) and flat (fill in any holes you dig so that turtles don’t become trapped). In fact, it’s recommended that you take only pictures and leave only footprints. Stay away from nesting shorebird habitat. Many beaches do not allow you to bring your pets to the beach for health and safety reasons and to protect venerable wildlife. Be sure to know the rules before you bring Fido to the beach. Finally, please help keep the beach tidy. When your visit is over, take back everything you brought. Food scraps attract unwanted animals, fishing line injures and kills birds and other wildlife and plastic is harmful to both the environment and the animals that sometimes mistake it for food. 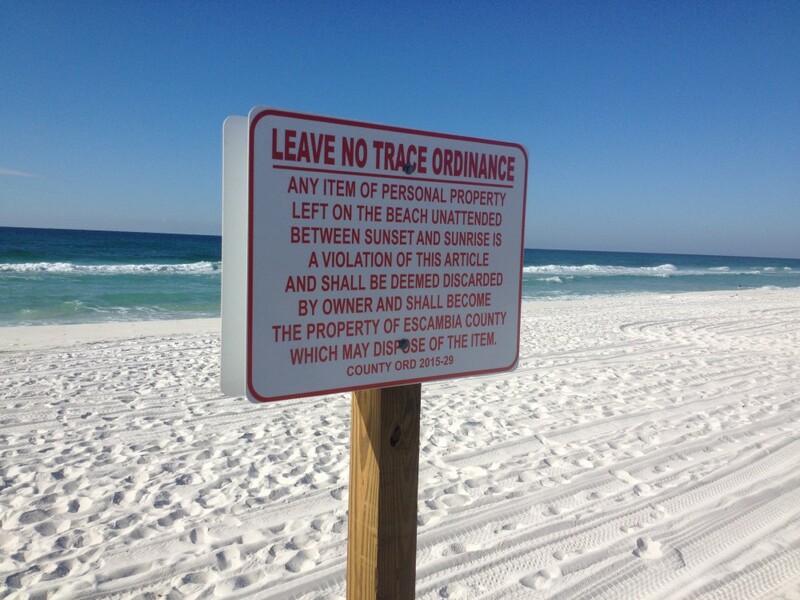 Abandoned beach furniture and toys can obstruct sea turtle nesting and hatching. The best policy is to leave the beach cleaner than you found it. Have a good time at the beach. Take a little time to learn and follow the safety rules that are there for your protection. Practice good citizenship by caring for and conserving the beach and ocean ecosystems in order to keep them beautiful in the present and for future generations. Many counties in the panhandle have lighting and barrier ordinances to protect wildlife and workers.